Sometimes you have to wonder… Just because they didn’t have photoshop doesn’t mean they couldn’t fake photos. 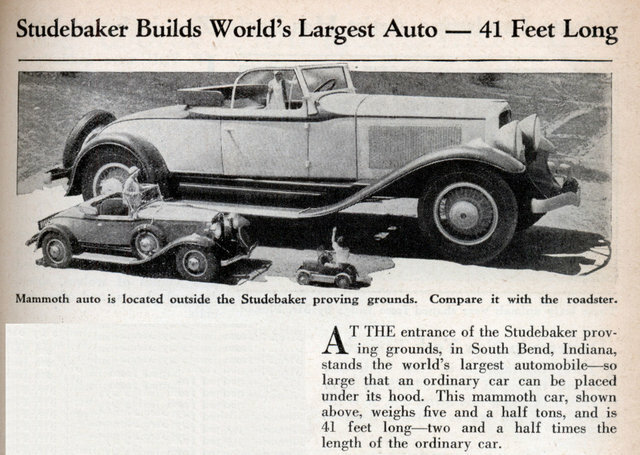 AT THE entrance of the Studebaker proving grounds, in South Bend, Indiana, stands the world’s largest automobileâ€”so large that an ordinary car can be placed under its hood. This mammoth car, shown above, weighs five and a half tons, and is 41 feet longâ€”two and a half times the length of the ordinary car. Or as we know it, a Ford Excursion. Thanks for finding that background info Firebrand. I’m from Indiana and a huge Studebaker fan and never heard of that thing. Not to mention I love giant advertising icons. A bowling alley just isn’t a bowling alley without giant pins out front!! You’re welcome. Its a shame that Studebaker decided to destroy the car in 1936. Its like old movie studios destroying films after showings to recover the silver. Funny how sensibilities change. I feel that way whenever they knock down an old casino in Vegas. At least there are pictures! Or how the first years of Johnny Carson on the Tonight Show are lost because the videotapes were reused repeatedly. Now we’re on a roll, how about seeing those cans of lost celluloid film from the silent era that have deteriorated beyond repair? And the only reason the Marmon Wasp survived to be restored and put in the Indy 500 museum is because it sat on the roof of a junkyard building while dozens of its siblings were crushed for scrap during WWII. When he was a kid, my uncle used to walk by the place every day and scored a bunch of name plates from the old racers. Sure it’s not a fake. Here ia an another article about it, and photos of its destruction. I never said it was a fake. I just said it looked liked one. Actually one thing I love is when people look at one of these images and instantly assume it’s a photoshop job. 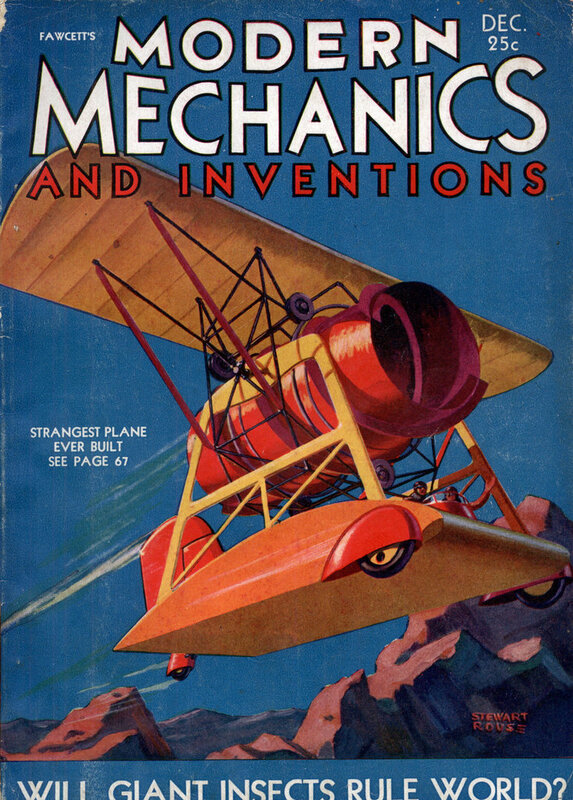 This one is my favorite http://blog.modernmecha…. Someone linked to that on another blog and all the commenters were complaining how bad a job the person had done in photoshop.